These three new watches - the Aviator 8 B01 Chrono¬graph 43 Curtiss Warhawk, the Aviator 8 Chronograph 43 Curtiss Warhawk, and the Aviator 8 Automatic 41 Curtiss Warhawk - salute a partnership between two true aviation pioneers. The Aviator 8 watches reflect the proud aviation heritage of two important brands but, with their modern retro flair, they are sure to appeal to a new generation of watch enthusiasts. Aviator 8 B01 Chronograph 43 Curtiss Warhawk: Breitling Manufacture Caliber 01, COSC-certified, 28,800 vph, approximately 70-hour power reserve. 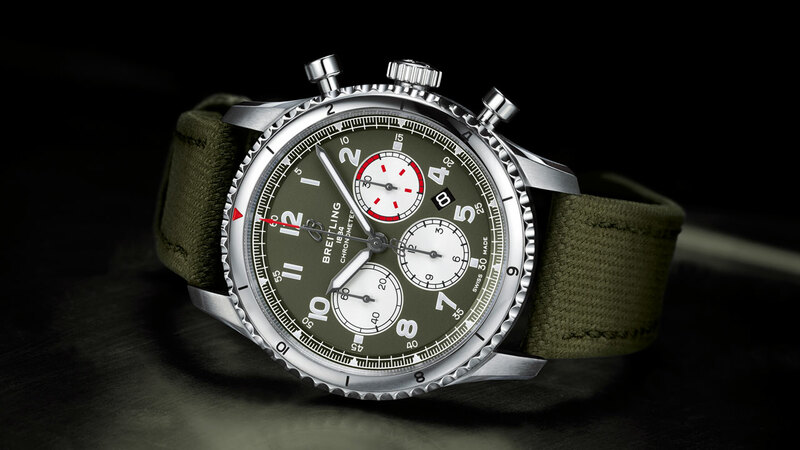 Aviator 8 Chronograph 43 Curtiss Warhawk: Breitling Caliber 13, COSC-certified, 28,800 vph, approximately 48-hour power reserve. 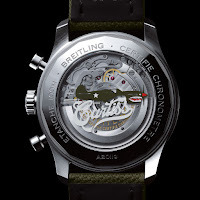 Aviator 8 Automatic 41 Curtiss Warhawk: Breitling Caliber 17, COSC-certified, 28,800 vph, approximately 40-hour power reserve. Aviator 8 B01 Chronograph 43 Curtiss Warhawk: Hours, minutes, seconds, date, 1/4th second, chronograph 30-minute and 12-hour counters. Aviator 8 Chronograph 43 Curtiss Warhawk: Hours, minutes, seconds, day, date, 1/4th second, chronograph 30-minute and 12-hour counters. Aviator 8 Automatic 41 Curtiss Warhawk: Hours, minutes, seconds, date. 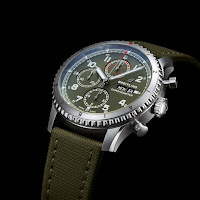 Chronograph models: Stainless-steel, 43 mm, bi-directional bezel with red pointer, convex anti-reflective sapphire crystal. Water resistant to 100 metres (10 bar/330 ft). 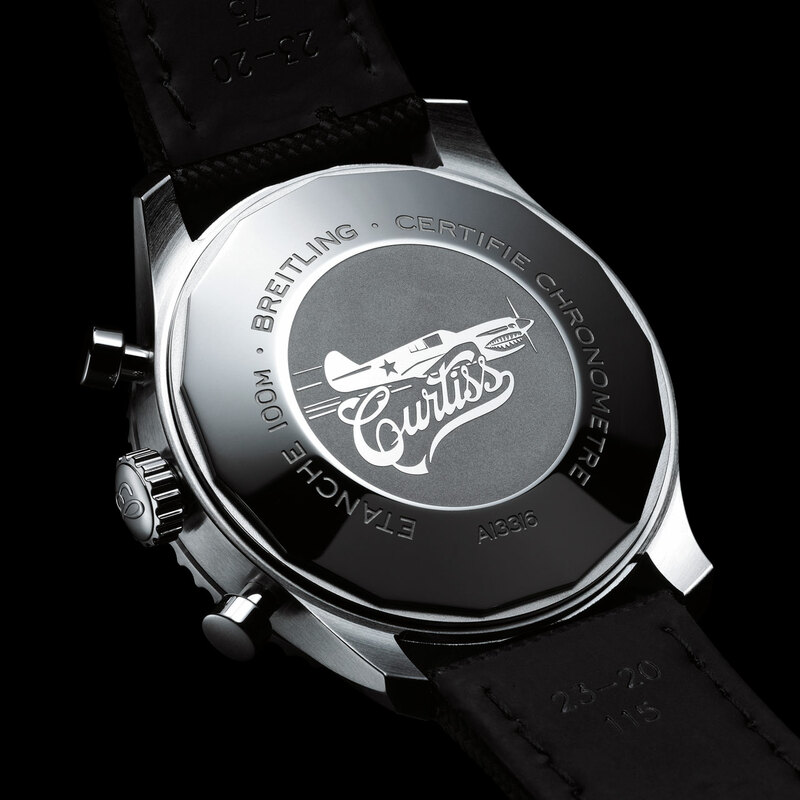 Three-hand: DLC-coated stainless-steel, 41 mm, convex anti-reflective sapphire crystal. Water resistant to 100 metres (10 bar/330 ft). Military green with matte finish, Super-LumiNova® hands, numerals. Chronographs: Green military strap with pin buckle or stainless-steel bracelet with folding clasp. 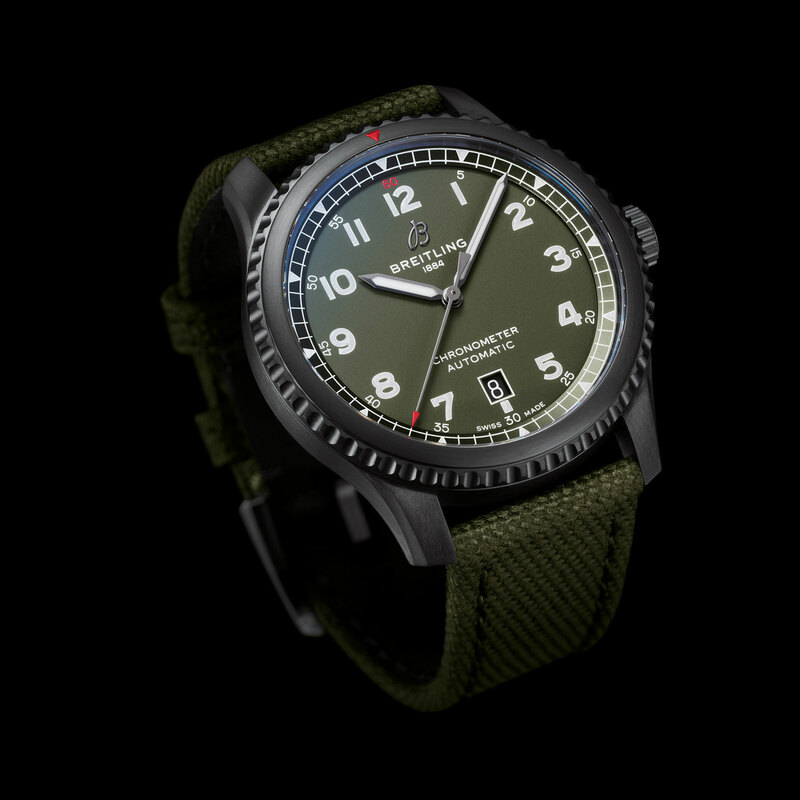 Time only: Green military strap with pin buckle.